If you’re already taking Viagra, Levitra, or Cialis for ED, fill out the form to save money on your ED prescriptions with this new program! 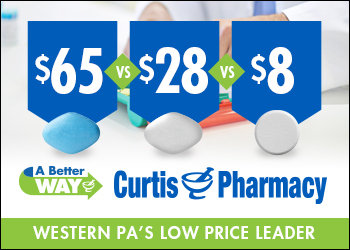 It's Curtis Pharmacy's desire to assist in reducing our patients' costs so they are able to pay for their ED medications. We CANNOT substitute any prescription (or refill) written for Viagra® without a phone call to the prescriber. Tell your doctor and pharmacist if you are allergic to sildenafil, any other medications, or any of the ingredients in sildenafil products. Ask your pharmacist for a list of the ingredients. Do not take sildenafil if you are taking or have recently taken riociguat (Adempas) or nitrates (medications for chest pain) such as isosorbide dinitrate (Isordil), isosorbide mononitrate (Monoket), and nitroglycerin (Minitran, Nitro-Dur, Nitromist, Nitrostat, others). Nitrates come as tablets, sublingual (under the tongue) tablets, sprays, patches, pastes, and ointments. Ask your doctor if you are not sure whether any of your medications contain nitrates. Tell your doctor and pharmacist what prescription and nonprescription medications, vitamins, and nutritional supplements you are taking or plan to take. Be sure to mention any of the following: alpha blockers such as alfuzosin (Uroxatral), doxazosin (Cardura), prazosin (Minipress), tamsulosin (Flomax, in Jalyn), and terazosin; amlodipine (Norvasc, in Amturnide, in Tekamlo); certain antifungals such as itraconazole (Onmel, Sporanox) and ketoconazole (Nizoral); anticoagulants ('blood thinners') such as warfarin (Coumadin, Jantoven); certain barbiturates such as butalbital (in Butapap, in Fioricet, in Fiorinal, others) and secobarbital (Seconal); beta blockers such as atenolol (Tenormin, in Tenoretic), labetalol (Trandate), metoprolol (Lopressor, Toprol XL, in Dutoprol), nadolol (Corgard, in Corzide), and propranolol (Hemangeol, Inderal LA, InnoPran); bosentan (Tracleer); cimetidine ; efavirenz (Sustiva, in Atripla); erythromycin (E.E.S., E-Mycin, Erythrocin); HIV protease inhibitors including amprenavir (Agenerase; no longer available in the U.S.), atazanavir (Reyataz, in Evotaz), darunavir (Prezista, in Prezcobix), fosamprenavir (Lexiva), indinavir (Crixivan), lopinavir (in Kaletra), nelfinavir (Viracept), ritonavir (Norvir, in Kaletra), saquinavir (Invirase), and tipranavir (Aptivus); nevirapine (Viramune); other medications or devices to treat erectile dysfunction; medications for high blood pressure; certain medications for seizures including carbamazepine (Carbatrol, Epitol, Tegretol, others), phenobarbital, and phenytoin (Dilantin, Phenytek); rifabutin (Mycobutin); and rifampin (Rifadin, Rimactane, in Rifamate, in Rifater). Your doctor may need to change the doses of your medications or monitor you carefully for side effects. Many other medications may also interact with sildenafil, so be sure to tell your doctor about all the medications you are taking, even those that do not appear on this list. If you are a woman and you are taking sildenafil to treat PAH, tell your doctor if you are pregnant, plan to become pregnant, or are breastfeeding. If you become pregnant while taking sildenafil, call your doctor. If you are taking sildenafil to treat erectile dysfunction, tell your doctor if you have ever been advised by a healthcare professional to avoid sexual activity for medical reasons or if you have ever experienced chest pain during sexual activity. Sexual activity may be a strain on your heart, especially if you have heart disease. If you experience chest pain, dizziness, or nausea during sexual activity, call your doctor immediately and avoid sexual activity until your doctor tells you otherwise. Tell all your healthcare providers that you are taking sildenafil. If you ever need emergency medical treatment for a heart problem, the healthcare providers who treat you will need to know when you last took sildenafil.